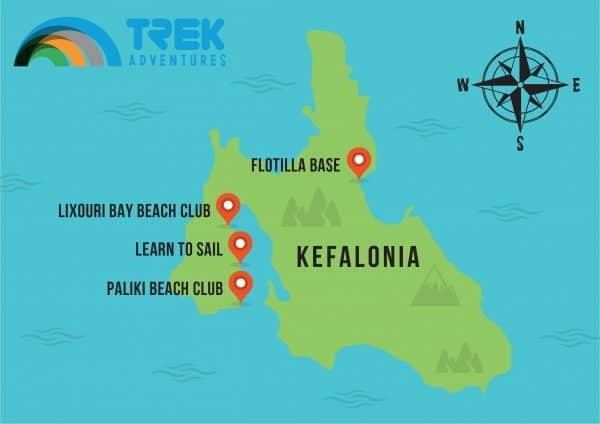 Our combined active holidays, Fitness, Pilates and Water Sports on the fabulous Greek Island of Kefalonia could possibly be the perfect addition to your summer. All levels of fitness and abilities are welcome for both the water sports and active fitness sessions. We are very excited to have teamed up with London fitness specialists BlitzFitness to offer what we think is the perfect long weekend of activity holiday. 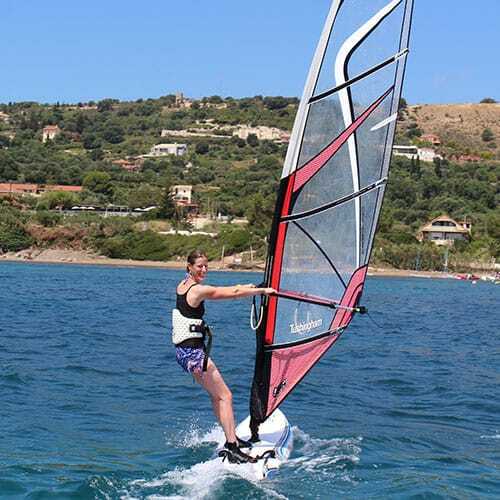 Fitness, water sports and a spot relaxing in the Greek sunshine. Nestled among the olive groves and with stunning sea views, our lovely pool, taverna and bar are at the heart of this great little beach sailing club. 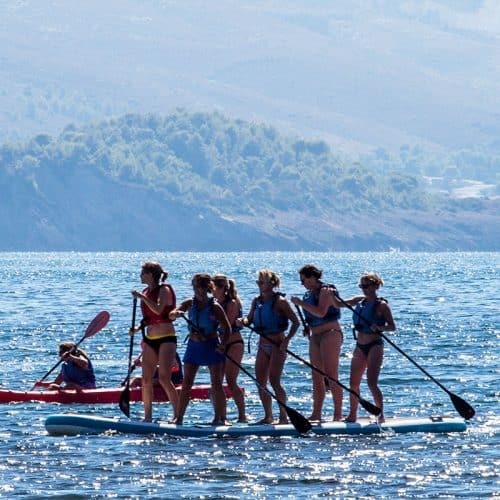 Great accommodation, zinging fresh local taverna food, and a friendly laid back atmosphere with plenty of soul, all make this fantastic activity fitness holidays Greece. Well known for its starring role in the film ‘Captain Correlis Mandolin’, Kefalonia has a stunning coastal scenery, a fascinating rural charm and incredibly friendly locals. It’s a laid-back place where the pace is set firmly to slow. Lixouri Bay beach club is only a 2min cab ride from the town square. We’re in a peaceful spot overlooking the bay surrounded by olive groves. 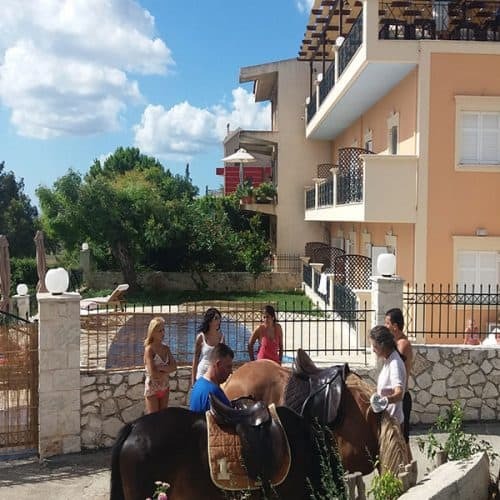 There’s a great local taverna, famous for it organic meat, within walking distance from the club and some stunning “sunset” tavernas only a 10 minute cab ride away to the famous Petani beach. Life in Lixouri, the friendly little town only 4km south along the coast from our Lixouri Bay beach club revolves around the main square, where you’ll find local tavernas, bars and lively pavement cafés – and our great little yacht marina. 1 hour transfer from the airport. Out of high season, away from those little people and that intense summer heat, our June & September Beach Fitness and Pilates holidays are the perfect opportunity to enjoy a guilt-free week of indulgence and relaxation, BUT, with some high intensity work outs, pilates and a bit of windsurfing tuition thrown in the mix – sounds exhausting !!!! Unwind the stresses of the year past. Be on the water, under the water and more importantly, by the water for a few games of backgammon or pit pat, with an ice cold G&T. 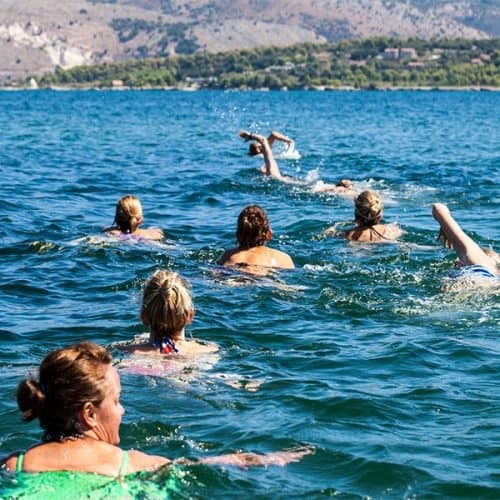 Singles, couples and friends are all welcome at our popular Fitness Weeks in Greece. Our Lixouri Bay accommodation is very comfortable indeed, simply furnished and beautifully presented. Most rooms have wonderful sea views, overlooking the beach and across the bay to the mountains beyond. Spacious, cool and modern with excellent self-catering facilities and tea/coffee making facilities. There’s an internal lift also if required, and great WIFI throughout. Depending on your requirements choose between our studios or 1 bedroom apartments. Karen Crump and Lara Milward are the founders of BlitzFitness, an award winning outdoor fitness company based in London. You will be in good hands as both are Level 3 Advanced Instructors and Personal Trainers. 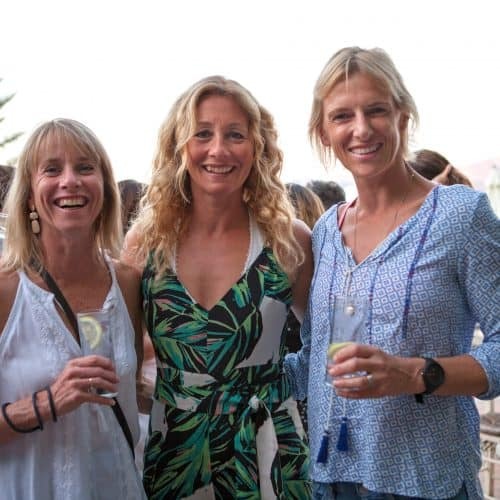 They are members of the industry organisation, REPs, and between them hold qualifications in nutrition, boot-camp fitness, pilates and circuit training, among others. The two trainer approach to every fitness session allows BlitzFitness to provide a challenging and invigorating workout for all fitness levels. Whilst one trainer is teaching the other provides careful and considerate technical attention to every client. BlitzFitness seeks to create a great group camaraderie. Our Hotel and Beach team will ensure that the everything from the Quinoa seeds in the morning buffet, to the high speed catamaran blasting in the afternoon is taken care of. Safety on the water is of course our first priority. Fully qualified RYA instructors run the beach operation and are vigilant both on the beach ,and on the water in our registered rescue craft with handheld VHF radios, always working to strict safety ratios and other proven guidelines. Mandatory buoyancy aids, mast floats on all boats to prevent full capsizes, prop guards on the safety boats, restricted sailing areas and a compulsory “safety clinic” at the start the holiday are just some of the many things we do. We offer this active holiday as a “Club Board” option – all breakfasts and 2 evening meals are included. 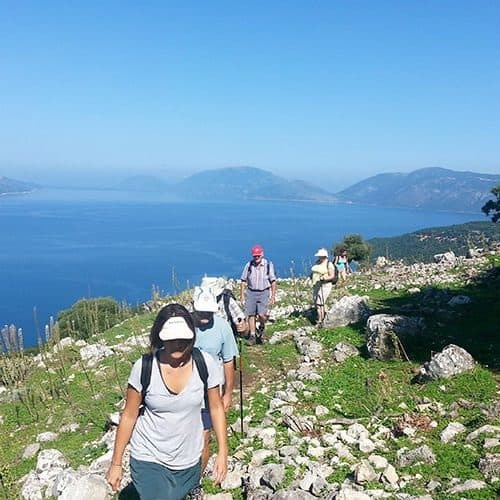 This gives you the opportunity to choose lunch options and explore the local area and its fantastic scenic tavernas on a couple of evenings – which is a must do. On arrival night after welcome drinks, we’ll organise a delicious Greek spread of grilled meats, fish and vegetables cooked on an open charcoal grill and served at our stunning rooftop restaurant. On last evening you’ll experience the wonderful “gala” meal out, at one of the best tavernas in the Greek islands – only a short ride from the club. Don’t expect drab international fare, at the Club you can expect to taste an excellent variety of locally sourced and zinging-fresh ingredients, served at the club taverna which is open for breakfast and lunch daily. From classic Greek kitchen dishes cooked by Mamma, seasonal salads and freshly grilled sardines, to a hearty club hamburger we will ensure that all dietary requirements are catered for. Snacks/drinks are available from the Beach Bar all day. Kefalonia has 48 varieties of grape grown locally, producing some very fine, internationally recognised wines worth trying, along with some fantastic Hellenic beers, there’s plenty to sample and enjoy. Arrival night welcome drinks, evening meal, BBQ grill night of local meats, fish, salads etc. There are 2 evenings when dinner is not included. Bar snacks are available to order on these evenings should you wish to stay at the club. Or why not try venture out and experience some of the delicious food on offer locally. Here’s some options to check out in the local area. We really suggest trying out a great little Greek taverna “Faros” which is only a 15 minute walk along the beach – really authentic with stunning views, amazing grill and Kefalonia dishes – super value too. A sunset meal at one of the best beaches in the Greek islands is also a must. Petani beach and taverna “Erasmia“. Only a 10 minute taxi ride from the club. This place is incredible – get there early for a swim and settle down for a wonderful eating experience. Head into town and Lixouri square, 5 minutes in a taxi from the club. A wonderful place to watch the world go by with countless cafes, tavernas and bars. Whatever you do don’t miss the best ice cream in the world at “I-Scream” – divine.